FIGURE 6.24 Pressure-temperature diagram of a single effect, LiBr-water absorption cycle. (Kizilkan et al., 2007), and a schematic presentation on a pressure-temperature diagram is illustrated in Figure 6.24. 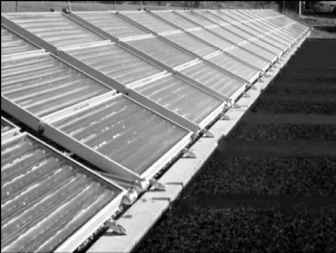 The main components of an absorption refrigeration system are the generator, absorber, condenser, and evaporator. In the model shown, QG is the heat input rate from the heat source to the generator, QC and QA are the heat rejection rates from condenser and absorber to the heat sinks, respectively, and QE is the heat input rate from the cooling load to the evaporator. With reference to the numbering system shown in Figure 6.23, at point 1, the solution is rich in refrigerant and a pump (1-2) forces the liquid through a heat exchanger to the generator. The temperature of the solution in the heat exchanger is increased (2-3). 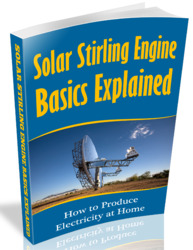 In the generator, thermal energy is added and refrigerant boils off the solution. The refrigerant vapor (7) flows to the condenser, where heat is rejected as the refrigerant condenses. The condensed liquid (8) flows through a flow restrictor to the evaporator (9). 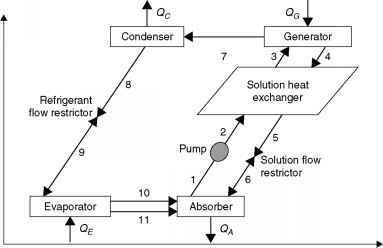 In the evaporator, the heat from the load evaporates the refrigerant, which flows back to the absorber (10). A small portion of the refrigerant leaves the evaporator as liquid spillover (11). At the generator exit (4), the steam consists of absorbent-refrigerant solution, which is cooled in the heat exchanger. From points 6 to 1, the solution absorbs refrigerant vapor from the evaporator and rejects heat through a heat exchanger. This procedure can also be presented in a Duhring chart (Figure 6.25). This chart is a pressure-temperature graph, where diagonal lines represent constant LiBr mass fraction, with the pure water line at the left. FIGURE 6.25 Duhring chart of the water-lithium bromide absorption cycle. 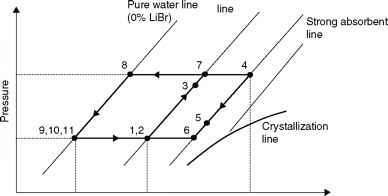 How to draw duhring chart plot for LiBr water single effect absorption?